In recent versions of Acctivate, users are able to Void Posted Inventory Transactions. This help article will show you some things to consider when voiding transactions which establish Lot or Serial numbers. 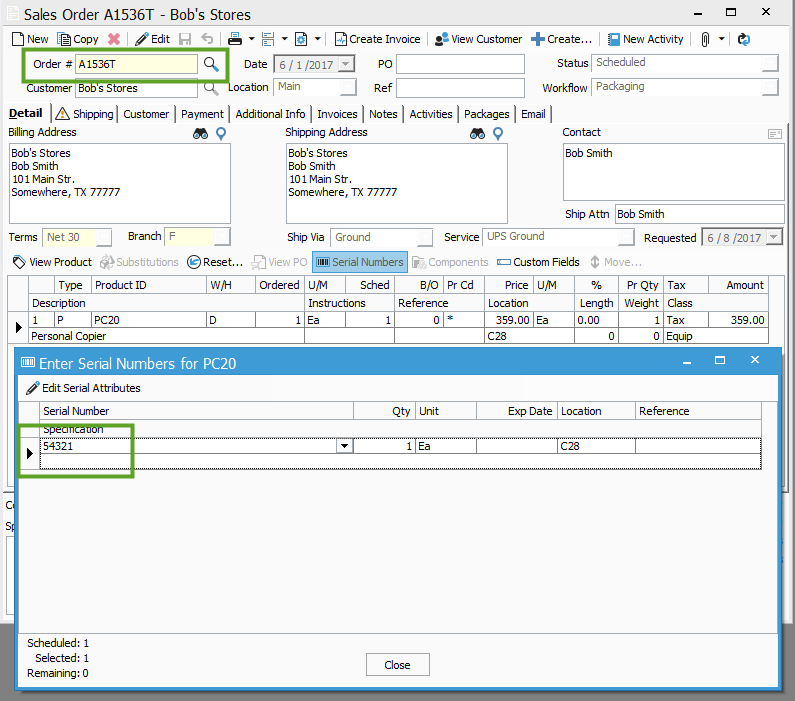 Receiving a Lot/Serial number on a Receipt, or creating a new Lot/Serial number in an Assembly Build transaction will add quantity to the specified product as well as the specified Lot/Serial number. In addition to this, the Lot/Serial number will be established in the database. 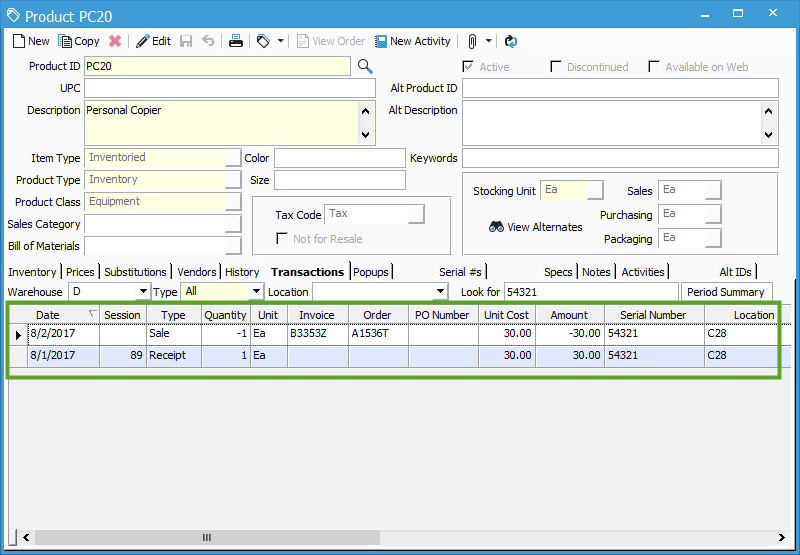 Voiding the Receipt or Assembly transaction which brought the Lot/Serial number into your inventory will remove quantity related to the product as well as that Lot/Serial number, but this will not remove the established Lot/Serial number from the database. In the screenshot below, notice that Serial number 54321 was received in the D warehouse for product PC20. This is the only transaction which has posted related to this particular serial number, which is why the Receipt is all that shows on the Transactions tab. After the Serial number has been received, let’s say that it gets scheduled on a Sales Order. In the screenshot below, notice that Serial number 54321 has been scheduled on order A1536T for PC20. Because the Serial number has already been established in the database by the Receipt, voiding the Receipt session will not remove the Serial number from the order, nor will it void the posted Invoice. In this next screenshot, we can see the Receipt which established the Serial number, but we can also see the Invoice which removed the Serial from the database. As of now, the On Hand quantity of this Serial number is 0. If the Receipt session is voided, all that is left is the Sale which removed the Serial number from inventory. This means that the On Hand quantity of the Serial number becomes -1. In order to bring this back to 0, you would have to post another transaction to put that Serial number back into stock. The same is true if an Assembly build transaction was used to add inventory to the Lot/Serial number, so keep that in mind when voiding Receipts or Assemblies which establish Lot/Serial controlled products.